The lovely new picture book, ExtraOrdinary Jane (Ages 3-100), by first time author-illustrator Hannah E. Harrison, has me all fired up—but in a good way. Jane, a fluffy little white circus dog, “was ordinary, in a world that was extraordinary.” She isn’t “mighty” like her elephant-lifting father, or “graceful” like her ballerina mother. She isn’t “daring” enough to be shot out of a cannon like her six canine brothers. Try as she does to “find her special talent,” she encounters either mediocrity (her paintings lack “pizzazz”) or failure (her musical renditions send others running). As parents, it can mess with our heads; even worse, it can bring out our own insecurities and prompt us to scrutinize everything our children do. We might lie in bed and wonder, will my child ever be the best at something? And what if he or she is not? More significantly, when will these thought patterns begin to rub off on them? If we continue to judge our children on the basis of outward achievement, when will the pressure become too much for them? When will they stop discovering for themselves and start performing for others? In this light, words like “ordinary” and “average” have become almost taboo. Calling your child “ordinary” (horrors!) is like saying you don’t believe in him; that you don’t think he has anything unique to offer the world. But have we forgotten that “extraordinary,” by definition, can only exist by comparison to others? Because the thing is, I do believe that my children are ordinary. And I also believe that they, like all children, ordinary or extraordinary, have unlimited gifts to offer the world. My children are incredibly special to me and to the people who love them; we marvel at everything they say and do. But, if I’m being honest, they’re not any more or less extraordinary than most kids. In the short time that they’ve been alive, they don’t seem to have any particular talents that rise to the top and set them apart. My son’s interests lie all over the place, and they’re unpredictable from day to day. He is as generous as he is bossy, as much a leader as he is a follower. Sometimes he tries really hard at stuff, and sometimes he gives up quickly. He reads no better or worse than most six year olds. And watching him on the soccer field is akin to watching a tortoise (albeit a smiling one) sunning himself on a rock. When did all of that become not good enough? 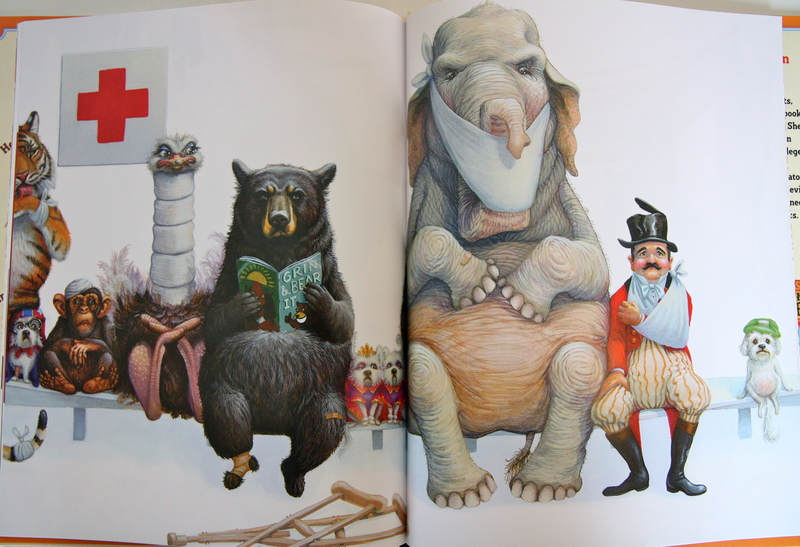 In the end, it is the exquisite illustrations that carry home the book’s powerful message. Across the final pages, the only text we are given is that “Jane…was just…Jane.” No further explanation is needed, save for pictures of the little dog enjoying an ice cream cone with a bear, helpfully polishing the cannons, and curling up inside the ringmaster’s arms. What we get is an opportunity to look at these pictures—of Jane being Jane—and embrace her for just that. Not for who we would like her to be. But for who she is. Sweet, hard-working, curious, kind. Happy. Ordinary. Loved. Perfectly said (and written). Three cheers for “ordinary”! A little white ordinary dog!! Hooray!! I gotta read this book. I was thinking of our loveable little white dog too. Those illustrations are fantastic! And I fit right into the appropriate age category, fortunately! fabulous review – can’t wait to go out and get this book for my grandchildren! You are currently reading Embracing Ordinariness at What to Read to Your Kids.